This is how to manually pay your gas, electric or water bills in Japan at a convenience store. Every month a meter reader comes to the flat and reads the meter for whichever company he belongs to. Yes there are three separate visits, one for gas, one for electric, and one for water. If these companies got together they could save a fortune! The meters are all outside the flat in a box on the wall. This is good because no one needs to be in for the meter to get read. The man reads the meter, prints off a service statement and posts this through the door. This service statement tells you how much the bill for that month will be. About a week later (or at the end of the month sometimes) the actual bill arrives through the post. This is what a gas bill looks like. 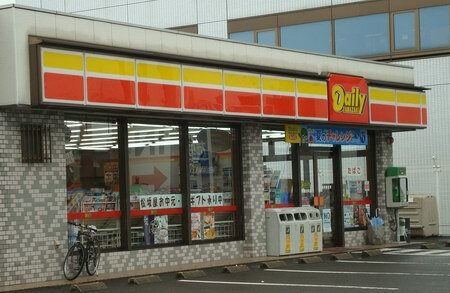 To pay it you can take it to a convenience store which handles bill payments (such as Daily Yamazaki or Lawson). You give them the bill. If you want to be polite you could say o-ne-gai-shimass. (おねがいします). They’ll scan the bill and take the money from you – at some combinis you may have to press a green button on the touch screen monitor. They’ll then stamp the bill in various places – the last one I paid got stamped in four places. They then tear off the stamped receipt part of the bill and give that back to you. This receipt is proof that you have paid you bill. And all is done until the next bill! This entry was posted on Friday, July 16th, 2010 at 2:56 pm and is filed under Japan. You can follow any responses to this entry through the RSS 2.0 feed. You can leave a response, or trackback from your own site. Thanks for the info! I arrived in Japan a month ago and have a stack of bills and wasn’t sure how to pay them. Now I can head over to the 7-11 with confidence! So, I got what looks like a receipt from the gas company in my door slot- just a list of how much was used, different pay rates, my name and a telephone number. No place to stamp if I paid or not, printed on standard receipt paper with ads for the gas company on back. I can’t read any of it, and the gas company doesn’t speak English. Is this my actual bill to pay, or just a receipt showing charges with an actual bill coming later? I got it last week and had no time to deal, and today I got a random letter in kanji from the apartment company, again, can’t read it. I am with Leo Palace if this helps. Hi Beth, this sounds like a gas statement. The bill which is payable in a combini will have a bar code on it, and a place for them to put an ink stamp on. The bill would usually arrive after the statement (assuming you haven’t signed up to pay by automatic bank debit). Do you have any Japanese speaking friends/colleagues who can translate the bill/letter for you? If not maybe a local foreigner association can help. Was the Leopalace letter personally addressed to you, or is a generic letter? They do sometime send letters to tell the residents to reduce the noise levels, put their rubbish in the correct place, or to notify you of works taking place in the building. If you can get a quality scan (not photo) of the letter you could try feeding it into the online OCR software described on this linked page, and see if it helps (it is very inaccurate, but you might just get enough keywords correctly translated to determine what the letter is about). 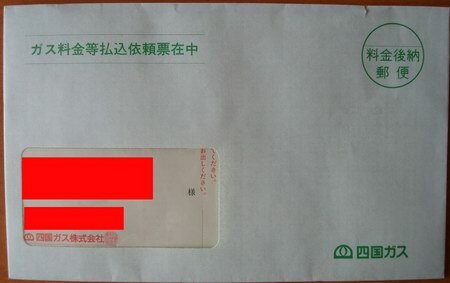 I didn’t see my name anywhere on the letter, and I am able to recognize my katakana name. I am very quiet, so if that wasn’t the gas bill, then the only other thing I could think of is if I haven’t been sorting or leaving my garbage on the right day. I have a chart, but do leave mine the night before, as I work really late nights and can’t get up early. Hi Beth – if the letter doesn’t have your name on it, then they probably sent it to everyone in the building. It might be nothing to do with you. Of course you’d need to get it translated by someone to know for sure. I had a quick question. I didn’t realize that my sewer bill was different from my water bill. When I moved into a Leo Palace, nothing was really explained. I have been paying my rent, water, gas, etc, but I just opened what I thought was a bit of junk mail- a card that you have to peel, and it looked like a bill. I researched the phone number (nothing was in english). It turned out to be from the city sewer department. I have been here several months, and I think I threw out a few of these when they came in a stack of junk mail- didn’t realize they were bills. No one has contacted me. Will I get a fine? How do I go and try to pay? I can pay the current bill, but I don’t have the old ones. I don’t speak Japanese. Thanks for any advice you can give me. Hi Beth, If you have thrown away your old bill and you can’t speak Japanese then you will have to find a Japanese speaker to call them. They can probably resend you the bills, or produce a new bill for you. I don’t know if they would give you a fine – hopefully not! Do you have any friends or colleagues who can help? If not then see if there are any foreigner help services at your city hall or local foreigner association. My gas bill went overdue (I wasn’t home to get my mail for a while) and they won’t let me pay it at Lawsons now. How do I pay it now? Hi Charlie, they might be able to issue you with a new bill but you’ll have to phone them up to do this. Either yourself or you’ll have to get a Japanese speaker to do this. i was wondering the bill you received was for all 3 utilities? Water, Electric and Gas? What is the average price of each utility? Hi Jack, In both Takamatsu and Tokyo the 3 utilities were managed by different companies so I had 3 bills. 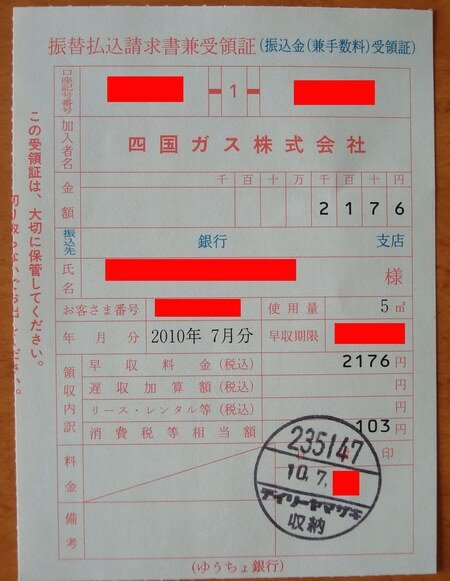 The gas/water were each about 2000 Yen for July 2011. The gas is only used to heat the water – the cooking hobs are electric. 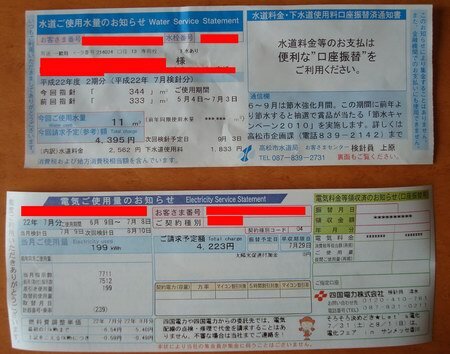 My electricity bill from February 2011 was for 7400 Yen. The February bill will have included a lot of electricity for heating. Damn I live in Minami Alps and live on a LeoPalace. I think they are asking me to pay direct deposit. I had 2 people come in for the gas and water and leopalace told me to prepare a 10,000 yen activation fee or something? Then the gas guy left me the form for the direct deposit. Hi Jack, I’ve no idea what that 10,000 yen might be for. I didn’t have to pay any initial deposit. I didn’t pay by direct deposit though. I always paid using the payment slips that they sent in the post. Since you have been getting bills what is the average kwh per yen payment been for you? Hi Jack, I’m no longer living in Japan. I did have a look to see if I could find any old bills but I’m afraid I couldn’t, so I can’t tell you what that value would have been. Hello, was wondering, what is the maximum amount of days i can wait before paying my Gas bill from the date I receive the bill? I know it’s best to pay asap, but just as a wonderment..
coz I don’t really see a date on my bill other than the billed period and the day of the next bill. Hi Mar, they seem to be fairly chilled about payment dates in Japan, but there will probably be information on the bill telling you when it should be paid (probably in a month). You might need to ask someone Japanese to see if they can spot anything on the bill.